When selecting a new cricket bat there are numerous factors that come into play when making that final decision on the one. Price, grade, brand and model are the obvious ones, but ultimately the weight plays an important factor. There are so many different models now available and each one will come in a variety of weights. Unlike tennis rackets which are manufactured to the precise gram, cricket bats will all vary in weight as they are mostly hand made using willow clefts. Each cleft will be different and this difference ultimately means each bat is unique in terms of weight. At our store in London we have literally hundreds of bats on display and each one is has its own characteristics, which our customers are able to see at their own leisure by going through the numerous bats we have on our shelves. Recently a lot of emphasis has been placed on exact bat weights as per scales and whilst this may seem like common sense and the perfect way to select at bat, in practice this method is more of a hindrance and actually very often results in the perfect bat being rejected. Speak to a bat maker and most will tell you than many Pro’s come in insisting on bats that weigh 2.8 or 2.9 but end up actually selecting bats that weigh more than that because they select on pick up and therefore the scale weight becomes irrelevant. I think a classic scenario happens around 2 years ago when a customer that visited our store came equipped with his own scales. He let us know quite clearly that he didn’t want our help and wanted to be left alone so he could select his bat. To us a customers wishes are paramount so we left him alone and carried on serving others in the store. Eventually I had to interupt him as around 2 hours had passed, he had been through and weighed over 100 bats and yet he looked totally lost. He was adament he didn’t want my help, but what he was saying to me just didn’t make any sense so I had to be just as stubborn and insist I do help him. He told me he wanted a bat that weighed 2.9 but all the bats we had were too light. That just didn’t sound right so I asked him to give me some examples and low and behold every bat he weighed in front of me looked nice and thick, with impressive profiles and good grains but sadly for him all weighed 2.5, 2.6, 2.7 and 2.9. One part of me smiled and saw pound signs as with those sort of weights we could send out some messages on social media and have them all sold within the week. The experienced part of me however informed the gentleman that there was a problem with his scales and low and behold they were indeed 4oz out. So he was basically picking out bats that were exactly what he was looking for, but discarding them because the scales said he should. Bat weight gives power, the heavier the bat the more it has to propel the bat further – similar ideology to Newtons Law. A skilled bats maker will look to make that bat pick up lighter. Careful shaping, design and know how, means a good bat maker will improve on the pick up and give it that lighter than its dead weight feel. That’s where pick up and not bat weight come into play. Also lets not forget cricket bat grips and stickers. 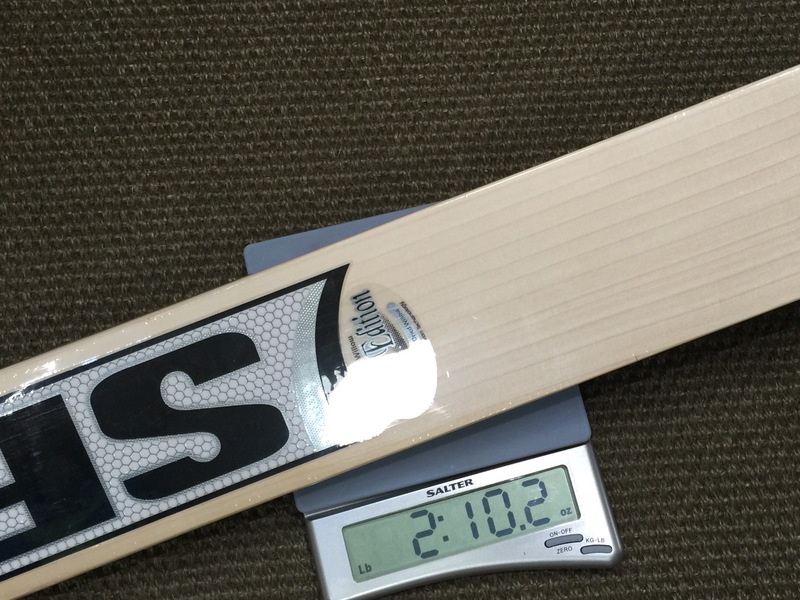 Today’s grips can weigh around 1.7oz and stickers weigh a similar amount, so a bat that’s crafted to weigh 2.7 ends up at 2.10 once it’s fully dressed up. The bat may weigh 2.10 but likewise the pick up may well be very different. The grip for starters helps the pick up, which is why we often suggest a 2nd grip on a bat. It will increase the scale weight but the pick up will become so much lighter. I could go on and on, but I think generally the message is clear. Always trust your judgement and what your mind and heart tell you. A scale will show you a number, but that number is irrelevant when your heart tells you something else. Select a bat that feels right and the timing will be so much better and the runs will soon follow.